Wake Forest is culturally vibrant offering many community festivals, art showings, garden and historic home tours, special events and a thriving farmers market. A quick commute to Raleigh and Durham offers many additional diverse cultural events. The Wake Forest Renaissance Centre for the Arts is the town’s cultural arts venue. Through exhibitions, workshops, community theatre, classes, concerts, guest artist’s appearances and special events, the center offers a wide variety of programming to encourage a flourishing arts community. The Wake Forest Historical Museum includes a diverse array of exhibits illustrating how life was lived in the town and its college. Never before seen documents, artifacts and collections of memorabilia tell the story of the town of Wake Forest and other surrounding areas. Friday Night on White held the second Friday of each month from April through September is a wildly popular, free, outdoor music series that draws thousands to downtown Wake Forest. 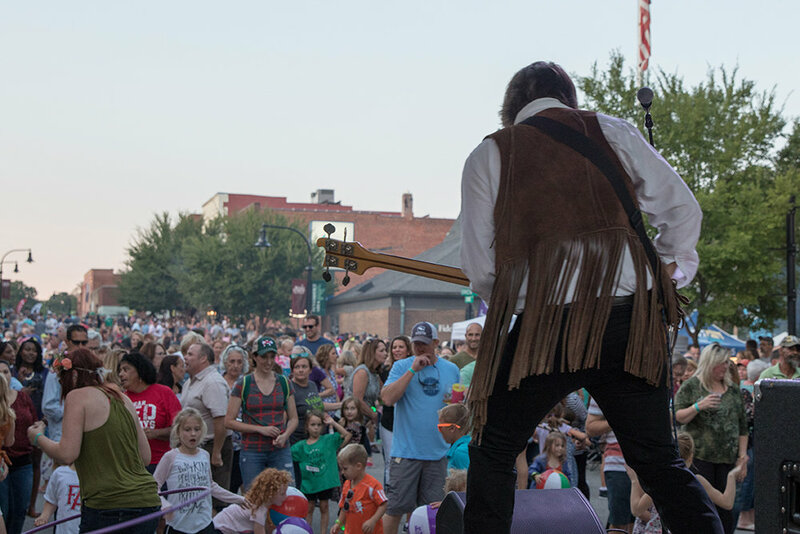 The streets come alive with live music, food and beer trucks and activities for the whole family. Six Sundays in Spring offers family-friendly, outdoor concerts at the beautiful E. Caroll Joyner Park Amphitheatre. From the weekly Wake Forest Farmers Market and Family Movie Nights at Joyner Park, to annual events such as Mardi Gras, Meet in the Street, the Fourth of July Celebration and Christmas Parade, there is something for everyone all the year through. For a complete list of events, see the Wake Forest Community Calendar. In addition, a quick drive to Raleigh opens up countless options including the North Carolina Symphony, Broadway-style theatrical performances, museums of art, history and natural sciences and more.